Eighty-two women climbed the steps of the Palais des Festivals at the Cannes Film Festival in an unprecedented red carpet protest to press for improved gender equality in the film industry. CANNES, France (AP) — Eighty-two women climbed the steps of the Palais des Festivals at the Cannes Film Festival in an unprecedented red carpet protest to press for improved gender equality in the film industry. 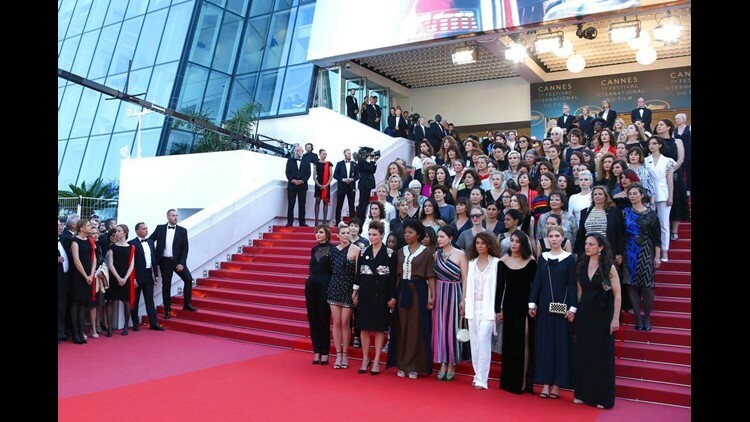 The number of stars, filmmakers and film industry professionals ascending the steps represented the number of female filmmakers who have been selected to compete at Cannes during the festival's seven-decade history. In contrast to their 82, 1,866 films directed by men have been picked for the prestigious festival lineup. Organizers said the event was orchestrated by the Time's Up movement and the French movement known as 5020x2020 to show "how hard it is still to climb the social and professional ladder" for women. It brought an array of film industry professionals to the Cannes red carpet, including actresses Salma Hayek and Jane Fonda, "Wonder Woman" filmmaker Patty Jenkins and French director Agnes Varda, a recipient of an honorary Palme d'Or at Cannes. Also joining were the five female members of this year's Cannes jury: Cate Blanchett, Kristen Stewart, Ava DuVernay, Lea Seydoux and Burundian singer Khadja Nin. Blanchett read a statement atop the Palais steps in English; Varda read it in French. "Women are not a minority in the world, yet the current state of the industry says otherwise," Blanchett said. "We stand together on these steps today as a symbol of our determination to change and progress." "The stairs of our industry must be accessible to all," she concluded. "Let's climb." The protest was held ahead of the premiere of French filmmaker Eva Husson's "Girls of the Sun," which is about a Kurdish battalion of women soldiers. Husson is one of three female filmmakers out of the 21 movies in competition for the Palme d'Or this year. The other two — Nadine Labaki's "Capernaum," and Alice Rohrwacher's "Happy as Lazzaro" — are to premiere next week. Cannes has come under increasing scrutiny in recent years over the number of female directors selected into its main slate, considered one of the most esteemed achievements in cinema. Jane Campion is the only female filmmaker to ever win the Palme. The festival supported Saturday's protest. Festival director Thierry Fremaux earlier this week hailed Saturday's event as a way for women "to affirm their presence." Fremaux has repeatedly insisted that the festival chooses its films purely based on quality. But he's also signaled that the festival is reanalyzing its procedures and making its selection committees gender-balanced.